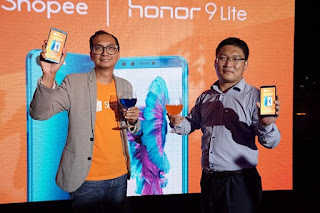 Starting the first flash sale held at the Shopee online store, Honor 9 Lite is well connected by consumers in Indonesia. This is evidenced by the depletion of stocks on such quick sales. Honor 9 Lite was introduced in Indonesia officially on 27 March. This product targets millennial youth segments by combining exciting designs and features. One of the mainstay of Honor 9 Lite is 4 cameras sold at affordable prices. Responding to the success of flash sale Honor 9 Lite, Honor Indonesia President James Young said, it will continue to strive to bring the best products and provide a different experience on smartphone users, especially young people in Indonesia. "We are pleased with the tremendous support of Indonesian customers," said James Yang, President of honor Indonesia. "Honor is dedicated to bring the best products to Indonesian consumers. We are excited to play an influential role in Indonesia and today marked the start of our exciting journey. Going forward, we will strive to deliver the best products and provide a different experience to smartphone users who can optimize the young generation in Indonesia. We are confident that we will achieve success with our fans here like how we can achieve this in other markets. " As the first product to be sold in Indonesia, Honor 9 Lite with a 13MP + 2MP dual-lens camera is competitive on the front and rear. It also comes with a beautifully designed 2.5D glass with mirror-like effects and a 5.65-inch Edge-to-edge FullView HD Display. In India, Honor 9 Lite sold out within six minutes during the first flash sale on Flipkart in January. In Southeast Asia, the device sold out several times during flash sale in Vietnam and Thailand, Now Honor is sold out in Indonesia in seconds. This success can not be achieved without Honor's commitment to offer new technology, aesthetic design and accessibility for younger generation . 0 Response to "Faster than India, In Indonesia Honor 9 Lite Expires in 1 Minute"